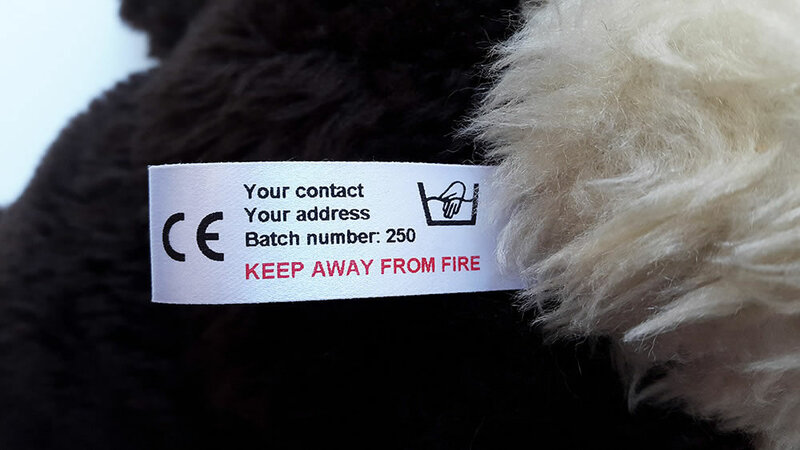 Carelabels is a West Yorkshire (UK) based label manufacturer. 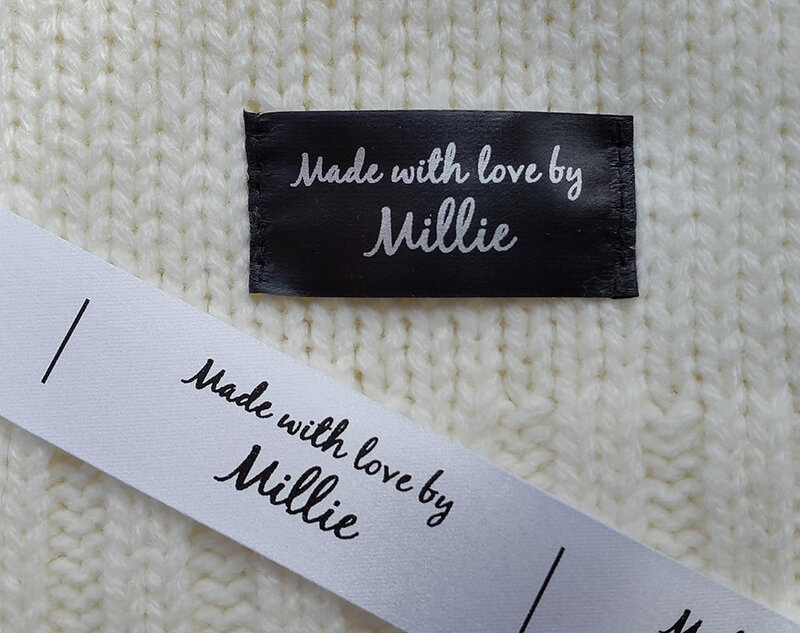 We specialise in the manufacture of printed sew on labels in the UK for use on clothing and other fabric items. And shipped across Europe and Worldwide. All of our sew on labels are custom made to your requirements. If you send us your ideas we will work with you to design and create a label that exactly suits your needs. Just tell us the wording you require and send your logo if you would like to add one. Simple graphic images work best. Try to avoid a lot of fine detail as it will often be lost when printed on fabric. This is also something to note when choosing your font styles. Fine script fonts with a lot of curlicues will look beautiful on paper but will often lose definition on fabric so we would advise the use of something a little bolder. We use a digital printing process with a computer based design package. This enables us to produce short runs of sew on labels with the minimum amount of waste. This also enables us to have a very quick turnaround and we can often despatch your sew on labels within 24 hours of design approval. This has proved to be very popular with our customers and is often commented on in their feedback. 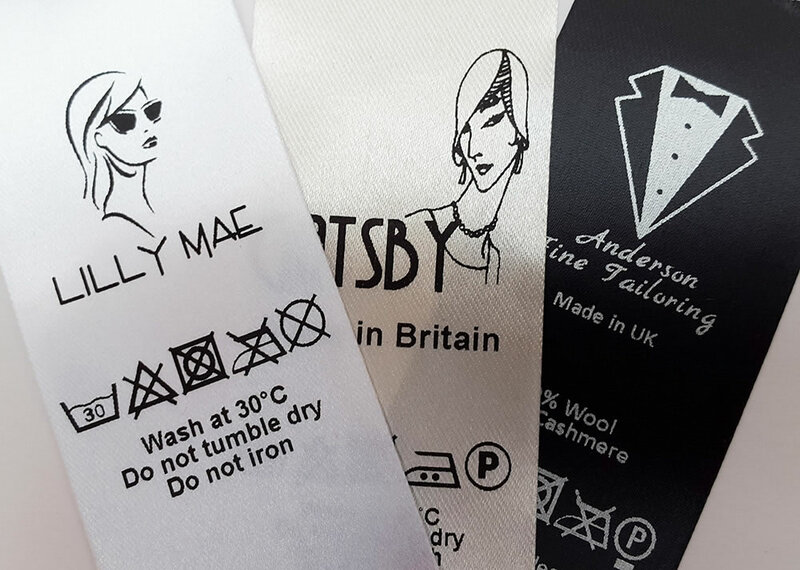 All of our sew on labels are printed on site in our UK office which means we have complete control over production and quality. This has always been very important to us and is something we don’t intend to change. We endeavour to use UK fabric and ink suppliers where possible. We are always researching new possibilities too. We use soft polyester satin fabrics to produce our sew on labels. We like to provide a label quality that is as flexible as possible for our customers. 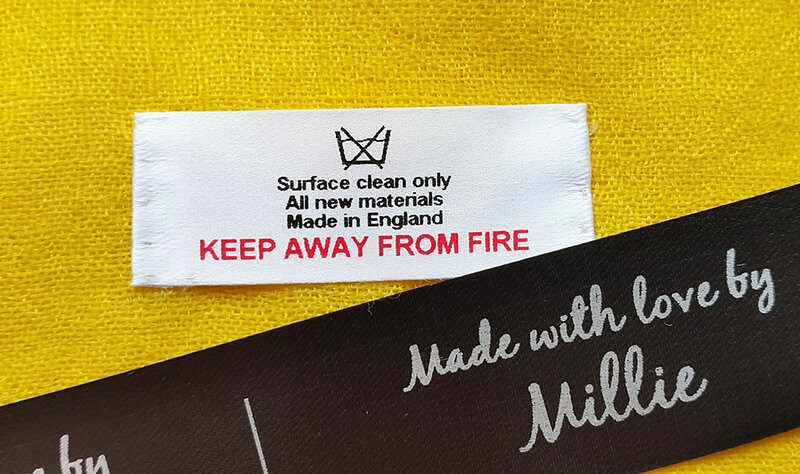 Obviously if you are producing children’s clothing you don’t want a harsh, scratchy label and this is equally true if you are producing lingerie. There is little point in adding your branding if the label is immediately cut out because it causes discomfort. We stock 3 label fabric colours (white, cream and black) in a variety of widths from 15mm up to 45mm. We also have various ink colours for you to choose from to add a bit of individuality to your labels. You will find all of the fabric and colour options on our website. A lot of our customers opt for black text and then add a little colour to their branding. We can add red print if you need to include safety warnings. This will be important if you are labelling children’s toys and some clothing. If you require CE labelling and sequential batch numbers for trace ability we can add those too. For government guidance which you may find useful visit the Gov.uk website. If you are selling items on a commercial basis you will be required to add fibre/fabric composition. 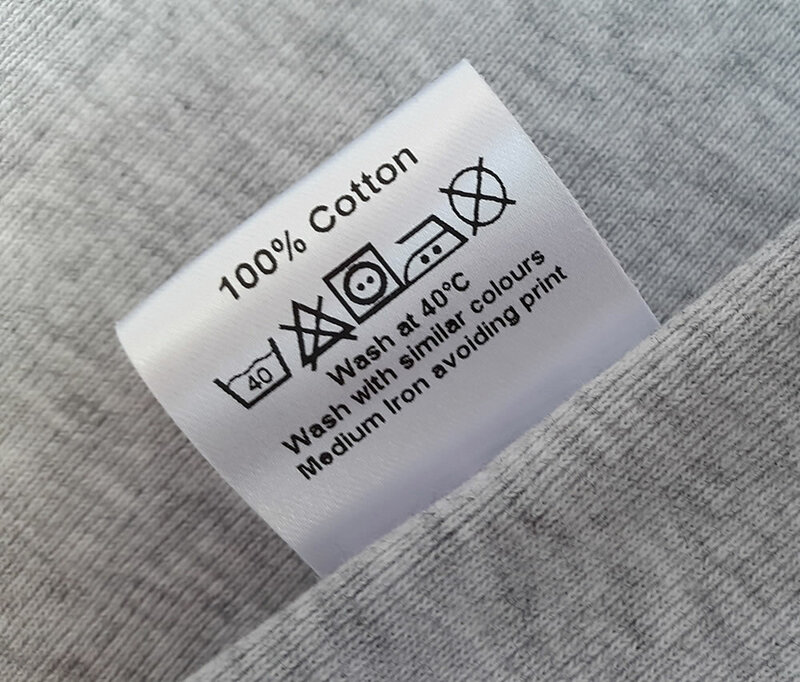 Here is a useful link giving details of Textile Labelling Regulations from the Department for Business Innovation & Skills. 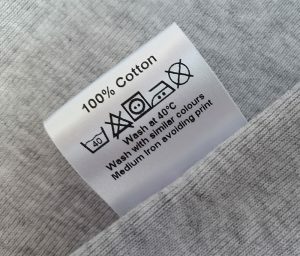 If you would like to add washing instructions just tell us what you need in words and we can add the relevant textile symbols. If you are unsure of the meanings here is a useful link www.care-labelling.co.uk. The majority of our customers come to us for a combination label. They like to include care and content information, their brand and sometimes size details. This means less sewing and all relevant information is shown on one neat sew on label. However, if you have multiple products or fabric types and want individual sew on labels for care/content, branding and size we can provide those for you. Once you have chosen your fabric colour and width the print details are entirely up to you. You can add as much text as you need. We will adjust the label length to fit accordingly. The sew on label style will depend entirely upon your requirements too. We have a number of options. We can supply sew in or sew on labels. Loop fold sew on labels are designed for you to fold in half and sew both ends into a seam (10mm sew space is included on each end). We usually supply these un-cut on a roll so that you can cut off and use as needed. These will need to be sewn into a seam to avoid fraying. We can also supply a cut and sealed version if this is more suitable for you. The design is divided on the label so that, once folded, you have a front and a back. Generally our customers request their branding on the front of the label and care/content on the reverse. Single and 2 sided sew on labels are supplied cut and sealed. This avoids fraying and means that you only have to sew in one end of the label. 2 sided labels are useful if you need to include a lot of information. You may need to add multiple language translations for fabric composition and this can result in a lengthy label. We can provide booklet format labels in order to keep the label length to a minimum. If you don’t have a seam on your items that you can sew into you may wish to have sew on labels instead. In this case we would suggest an end fold label or a single sided cut and sealed label. End fold labels will usually be supplied un-cut on a roll. Your design will be placed in the centre of the label (usually in a horizontal format) and we will include 10mm sew space at each side. You then fold each end under to give a flat, single sided label. You will need to sew both ends to avoid fraying. We can also supply a cut and sealed version which means no fraying and you can choose to have your label with or without extra sew space. Giving you the option to fold the ends under or leave the label flat. This gives a nice, neat label which you can sew on either at the two ends or all the way around for extra security. If you want to add some obvious branding to your items or important safety information that needs to be immediately visible this may be a good solution for you. If you have decided on the type of sew on labels you need and have some design ideas please get in touch and we will get back to you as soon as possible. We are always happy to help, so if you have any questions please do not hesitate to contact us.